​​ WHO ARE YOU- REALLY ? Inscribed above the doorway of the Delphic Oracle were the words "Know Thyself". We wake up in the morning and look in the mirror. We see a reflection of ourselves. At least that is what most people believe. However, what we see in the mirror is not ourselves. We only see the material body which our soul happens to be inhabiting at the moment. We are our soul, not our body. We look around the room and see the mirror, the sink the cabinets, the ceiling/walls/floor, the pictures, light fixtures, all solid objects. However, nothing is solid. There are really no solids in the Universe .Everything is energy and behind energy everything is just a thought. As we look around the room we see shapes, colors and hear sounds, but none of that is real. What we see and hear are frequencies of energy and energy is the product of a thought. When you go to a new place or meet new people what do you do? You give an introduction about yourself. You talk about who you are, what your name is, where you are from, what you do, etc. You attempt to establish your identity in the eyes and hearts of others. What you are really doing is attempting to establish your separateness from everyone else. "Any thought that you have had about yourself, however deflated or inflated, is not who you are. It is simply a thought. The truth of who you are cannot be thought, because it is the source of all thoughts. The truth of who you are cannot be named or defined. Words like soul, light, God, truth, self, consciousness, the universal intelligence, or divinity, while capable of evoking the bliss of the truth, are grossly inadequate as a description of the immensity of who you truly are. However you identify yourself: as child, adolescent, a mother, a father, an older person, healthy person, sick person, a suffering person, or an enlightened person – always, behind all of that, is the truth of yourself. It is not foreign to you. It is so close that you cannot believe it is you. The truth of who you are is untouched by any concept of who you are, whether ignorant or enlightened, worthless or grand. The truth of who you are is free of it all. You are already free and all that blocks your realization of that freedom is your own attachment to some thought of who you are. This thought doesn’t keep you from being the truth of who you are. You already are that. It separates you from the realization of who you are. I invite you to let your attention dive into what has always been here, waiting openly for its own self-realization. Who are you, really? Are you some image that appears in your mind? Are you some sensation that appears in your body? Are you some emotion that passes through your mind and body? Are you something that someone else has said you are, or are you the rebellion against something that someone else has said you are? These are some of the many avenues of misidentification. All of these definitions come and go, are born and then die. The truth of who you are does not come and go. It is present before birth, throughout a lifetime, and after death. To discover the truth of who you are is not only possible it is your birthright. Any thoughts that this discovery is not for you, now is not the time, you are not worthy, you are not ready, you already know who you are, are just tricks of the mind. It is time to investigate this “I” thought and see what validity it really has. In this examination, there is an opening for the conscious intelligence that you are to finally recognize itself. The most important question you can ever ask yourself is: “Who am I?” In a certain way, this has been an implicit question asked throughout every stage of your life. Every activity, whether individual or collective, is motivated at its root by a search for self-definition. Typically, you search for a positive answer to this question and run away from a negative answer. Once this question becomes explicit, the momentum and the power of the question direct the search for the true answer, which is open-ended, alive, and filled with ever deepening insight. You have experienced both success and failure. After a certain stage, early or late, you realize that, who you are, however that is defined, is not satisfying. Unless this question has been truly answered, not just conventionally answered, you will still be hungry to know. Because, no matter how you have been defined by others, well-meaning or not, and no matter how you have defined yourself, no definition can bring lasting certitude. The moment of recognizing that no answer has ever satisfied this question is crucial. It is often referred to as the moment of spiritual ripeness, the moment of spiritual maturity. At this point, you can consciously investigate who you really are. In its power and simplicity, the question “Who am I?” throws the mind back to the root of personal identification, the basic assumption: I am somebody. Rather than automatically taking that assumption as the truth, you can investigate deeper. It is not difficult to see that this initial thought, “I am somebody”, leads to all kinds of strategies: to be a better somebody, a more protected somebody, a somebody with more pleasure, more comfort, more attainment. But when this very basic thought is questioned, the mind encounters the I that is assumed to be separate from what it has been seeking. This is called self-inquiry. This most basic question “Who am I?” is the one that is the most overlooked. We spend most of our days telling ourselves or others we are someone important, someone unimportant, someone big, someone little, someone young, someone old, never truly questioning this most basic assumption: Who are you, really? How do you know: that is who you are? Is that true? Really? When you turn your attention toward the question “Who am I?” perhaps you will see an entity that has your face and your body. But who is aware of that entity? Are you the object, or, are you the awareness of the object? The object comes and goes. The parent, the child, the lover, the abandoned one, the enlightened one, the victorious one, the defeated one. These identifications all come and go. The awareness of these identifications is always present. When the question “Who?” is followed innocently, purely, all the way back to its source, there is a huge, astounding realization: There is no entity there at all! There is only the indefinable, boundless recognition of yourself as inseparable from anything else. You are free. You are whole. You are endless. There is no bottom to you, no boundary to you. Any idea about yourself appears in you and will disappear back into you. Let all self-definitions die in this moment. Let them go, and see what remains. See what is never born and what does not die. Feel the relief of laying down the burden of defining yourself. Experience the actual non-reality of the burden. Experience the joy that is here. Rest in the endless peace of your true nature before any thought of I arises." 1. The Atma- the highest level is the Universal Consciousness, which creates, maintains and builds the Universe (with the assistance of each individual Manas). That Universal Consciousness is often referred to as God. A Sanskrit word that means "self"; a ray of the Absolute ;not individual ; is omnipresent; a universal one ; contains the cognizer, the thing cognized and the cognition, all three in itself and all three one ; contains everything ; the one universal principle ; and it is simply a ray of light. 2. The Buddhi- Within the Atma (God), an individual piece of the Universal Consciousness is formed into an individual spirit or soul which is capable of distinguishing that thing from every other thing, i.e. individualization. It is from the root word "budh" (to be awake; to understand; to know); a feminine Sanskrit noun derived from the same root as the masculine form "Buddha": it refers to the intellect, the faculty of discrimination; called spiritual soul: the Monad- the one unit. 3. The Manas- (generally the human mind) it is the repository and storehouse for the individual emotions, experiences, knowledge and memory of one’s existence as a separate entity. The acquired level of memory, emotions, experiences and instincts of each individual soul is acquired in the development of each individual Buddhi/Manas from mineral, to plant, to animal and finally to human. It is the fifth principle in human beings. It is generally the "mind" it is from the root word "man" or "to think": it is the Higher Ego ( pronounced "egg-O") ; Individuality-, self-awareness ; the human soul ; it adds to Atma-Buddhi something of itself, and thus, assimilating itself to the Monad that reincarnates in a body life after life ; the Manas is immortal. NOTE: The three parts of the soul ( Manas, Buddhi and Atma , together known in general terms as a “Monad” ,( a combination of three things) are also referred to as a "Ahamkara". It is what reincarnates; what is called the "soul". 4. The Kama Rupa- or animal soul, consisting of the base emotions and instincts of each individual. 5. The Linga Sarira- (Astral Double, Astral Body of each individual) that is the higher product of the first two. 6. The Kama Prana- or life energy that powers the body of each individual. At birth each individual has a different amount of life energy and it is physically represented by the Aura. Some believe that we can demonstrate scientifically that all living things have an Aura by the use of Kirlian photography. Regardless as to whether that is true or not, the Aura is simply the light given off by the "Life Energy" of the body of a living thing during the process of life. 7. The Physical Body- the physical individual human being. NOTE: these latter four elements are what is left behind and what some people call a “ghosts” and are the things that are sometimes reached in a séance .A very dangerous practice. Most of the responses to the question of ‘Who am I” assume a substantive view of a self or person. That is, they assert that something abides through the stream of events and varying circumstances of one’s life, even in spite of them. Some call this a mind, spirit or soul; others just call it the body, or in more modern terms, the brain. The first group believes that in spite of bodily changes, the mind, spirit or soul stays the same entity, for it is ‘you’. The second group holds that the physical manifestation of ‘you’ is who you are. It is easy to locate ‘you’ or ‘me’ in the body, because this designates an easily recognized place in which personhood can reside. As human beings, we are quick to identify ourselves using our circumstances, how others perceive us, our behaviors, or our positions in life. It’s somehow comforting to clothe ourselves in these identities. But none of those are really who we are. And the problem with latching onto these identities is, in addition to limiting our growth, it leaves us lost and confused when they are stripped from us. The second group imagines that “you” or “I” can be found in the mind, spirit or soul, since these, not having certain reference points, are not places where anything can be located, in the normal sense of the word. But maybe this concern merely begs the question by making the hidden supposition that for something to exist it must be locatable in space and time. Many things exist, however, that are in time but not in space, such as past events, fictional characters and worlds, and the intervals between musical notes or spoken words. (Though some might argue that they are in four-dimensional space-time, like all entities.) Could it be, then, that mind, spirit or soul can exist in time although not in space? We sometimes cling to negative identities. “I’m a sick,” or “I’m not good with money,” or “I’m not musically inclined.” The benefit of maintaining a negative identity is that it surrounds us in an easily-defined, cozy comfort zone. We are clear about what we can and cannot do, so we never have to venture out. Of course, the downside to this is exactly the same: it surrounds us in an easily-defined, cozy comfort zone and so we think we are clear about what we can and cannot do so we never have to venture out! You are not your circumstances. You are not what you do. You aren’t a stay at home mom. You’re a woman who currently stays at home to raise your children. You aren’t a banker, but a man who currently works in a bank. You aren’t a dancer. You’re a person who dances. And when you can no longer do what you do, whether by choice or not, you will still be you. This example is still hotly debated by philosophers interested in personal identity. They sometimes discuss a related question: what if the old planks weren’t discarded but were used to build a second ship to the same plan as the first – which would be the original Ship of Theseus then? You are not what you do. You are not who you are with. You are not the roles you play in life. You are not your family, religion or race. You are not your age. You are not your gender. You are not your resume of jobs, interests and experiences. In religion the concept of “duality” has to do with good/evil. In psychology the concept of Duality has to do with the separateness or oneness of mind/body. However, in Spirituality the concept of Duality has to do with the concept of “non-duality” which holds that the world is an illusion. This is a dream world. The spiritual journey is one of awakening into the knowledge that we all are and remain a part of what some call God. We are not human beings who have spiritual experiences. 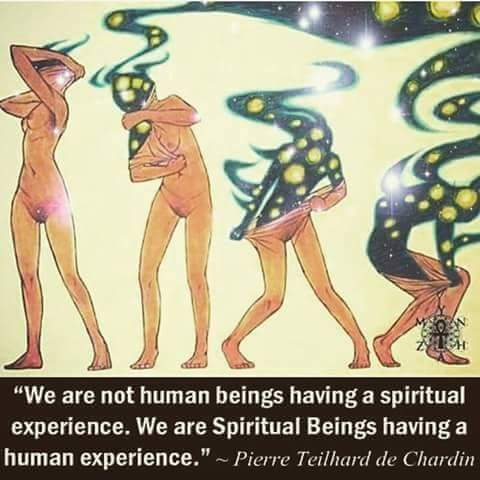 Rather we are spiritual beings having a human experience. Our true essence is spiritual. All of our experiences in life together creates the illusion of separateness of an individual's consciousness and gives one the impression of a separateness from all other things. In truth, it is all one with the illusion of separateness, speed, distance and time. Traditional Christianity says the human problem is sin and the answer is repentance. Gnostic Christianity said the human problem is ignorance and the answer is knowledge. We are eternal beings temporarily incarnated in a flesh covered skeleton. Our body will die , but our soul never will. ​We are one with everyone and everything else. We are the Universe, not just a part of it. The best way this writer can frame the words to describe this concept is that: “Everything is nothing, but nothing is everything, therefore everything is one”; that is the true nature of existence. That is the true meaning of “Who Are You- Really?”. Atma (also written “Atman”) is the higher most and supreme part of man’s spiritual being. It is pure eternal Spirit. It is the Higher Self, the Divine Self, the Real Self of the human being and it is literally one and the same in essence and identity as the Infinite Supreme Self. This is in accordance with the fundamental teaching of Hinduism; that our Self (the Atman) IS the Supreme Self (Brahman). Atman literally means Self. It is the only one of our Principles to which the unqualified term “the Self” may be applied. “The Monad” (meaning “ultimate unit” or “primary unit”) is a term used to describe the conjunction of the two highest Principles of the human constitution – Atma and Buddhi. There is nothing higher than Atma; Atma is the higher most and supreme part of man’s spiritual being. Because Atma is literally Divinity Itself, it has to have a vehicle through which to radiate its light to the individual soul. Buddhi is this vehicle and so the two in conjunction with each other are called the Monad. It has a dual nature, that of Higher Manas and Lower Manas. When the mind and consciousness are lifted, raised, and elevated towards higher things, spiritual things, abstract things, intellectual things, things of goodness, truth, purity, love, compassion, and beauty, it is then functioning as the Higher Manas and rising ever closer towards the divine shining light of Buddhi, the Spiritual Soul. When the mind and consciousness are instead allowed to sink downwards towards the lower, separate, selfish, and sensual things of life, it is Lower Manas, attaching itself to the principle of Kama, the Animal Soul. Kama, which literally means “Desire” in Sanskrit, is the desire principle of the human being when in physical incarnation. It is the source and center of his desires, passions, lusts, and sensual nature. It is sometimes referred to as the “animal soul” because it is the more animalistic and beastly part of us. Linga Sharira – called the astral body – is the subtle, unseen “double” of the dense physical body. It is the form, mold, and blueprint upon and around which the dense physical body is built. It comes into existence before the physical body and it only fully fades out and dies when the very last remaining particle of the deceased physical body disappears and disintegrates, excepting the skeleton. We are not doing ourselves any favors if we identify ourselves with our body or with any other aspects of our lower nature. These simply comprise our present personality, in distinction to the permanent individuality of the soul, the Reincarnating Ego. And higher still than the soul is our Real Self, pure eternal Spirit. Souls are many but Spirit is ONE. The whole aim of life is to realize Who and What you really are and to re-become it in consciousness. Only the inner is the real.